Both side engraving works of Tabli and dandee, Rose leafs on >> the neck of the Sitar, Rose pegs fully decorated. - Double gourd Tarafdar Sitar of 13 taraf strings. We are counted amongst eminent and leading companies for offering an extensive range of Classical Sarod. The Classical Sarod of our company can be used to create lyrics of song. This Classical Sarod is used by film industry professionals, others who use it for entertainment in parties, bars and many more. We are offering our clients superior quality Gopichand Iktara Instrument.These are available in three sizes small, medium and large. Our company has been successful in winning appreciation from the clients as one of the most prominent names in the trading of Santoor. Matching up with the ever increasing requirements of the customers, our company is involved in offering Musical Dilruba. Ustad Amjad Ali khan Model.We offer Sarod Instrument with high-quality instruments the resonance body, the neck and the peg box are made from one single piece of wood. The type of wood that is used tun wood. Made from well seasoned Tun wood. The best quality Goat skin is mounted on the sound chamber for concert sound and tone. Fitted with lotus shaped tuning pegs and a special chrome-plated finger board with fine craftsmanship. String Combination: 10 Main strings and 15 Tarab strings. In order to keep pace with never ending demands of the customers, our company is instrumental in presenting excellent quality assortment of Male Tambura. Our company holds immense experience in this business and is involved in offering an optimum quality range of Wooden Sitar to our clients. This Wooden Sitar is made using a single piece of wood to ensure its longer functionality. We can also customize these products following the requirements of our clients. Banking on our enriched industry experience, we are able to supply Sarod. 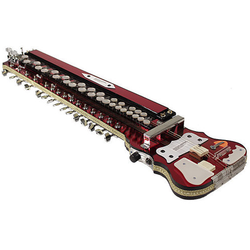 Our organization has gain lots of popularity in the market offering best array of Dilruba Sitar that is easy to tune. The sarod is a stringed musical instrument, used mainly in Indian classical music. 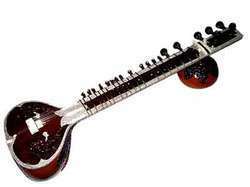 Along with the sitar, it is the most popular and prominent instrument in Hindustani northern Indian and classical music. The sarod is known for a deep, weighty, introspective sound, in contrast with the sweet, overtone-rich texture of the sitar.